The Scandia chair is revolutionary in both shape and expression. By using horizontal ribs, designer Hans Brattrud strung up a two-dimensional laminated shape and made it three- dimensional. The construction was ingenious at the time and provided the basis for a unique and timeless design. Materials: Laminated lacquered wood in American walnut or oak. Satin chrome steel bolt base. Hans Brattrud (born 1933) designed the Scandia stackable chair in 1957 as a student project at the National College of Art & Design in Oslo. The chair was revolutionary both in shape and expression. By using horizontal ribs, Brattrud strung up a two-dimensional laminated shape and made it three-dimensional. The construction was ingenious at the time and provided the basis for a unique and timeless design. 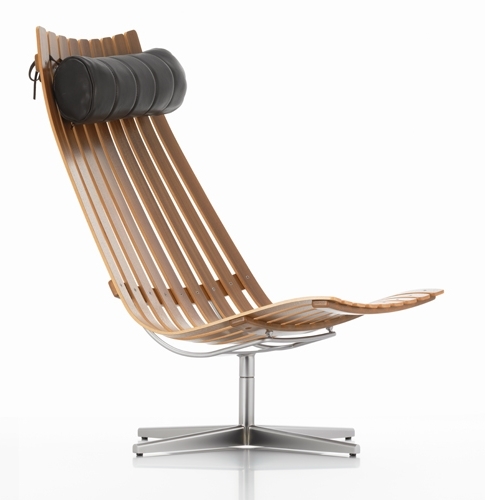 The chair was first produced in 1960 and released to the general public the following year. Brattrud gradually expanded, developing a series of models and variations including Scandia Tilt,Scandianette and Scandia Senior. 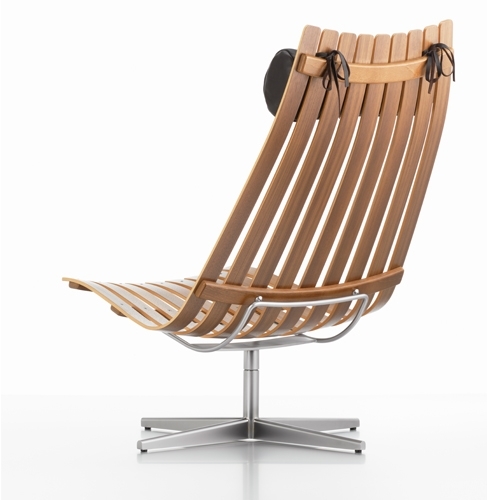 At Deutsche Handwerksmesse in 1967, Brattrud received the gold medal from the Bavarian State Government for Scandia Jr. With the armchair Arktis, designed in 1961, he continued to innovate with laminate materials. In 1964 he founded an architectural office and a factory for the production of prefabricated housing. Today the Scandiaseries is produced by Fjordfiesta.